Mac and cheese is a pillar of the American diet. We grew up with it, we have our favorite recipes—it’s a classic. When you’re in the mood to try pure cheesy bliss, the following excellent 10 mac and cheese places in Nevada are sure to do you right. Truffles n Bacon Café in Las Vegas, Nevada, is known for two things: truffles and bacon. But, like every great menu, theirs has a special place devoted entirely to mac and cheese. They offer four different kinds of mac, including their Maggie’s Mac, which combines truffle oil, bacon, mushrooms, and white cheddar. Barbecue places are only as good as their sides (at least in this author’s estimation), which means Nevada Barbecue Company is absolutely outstanding. 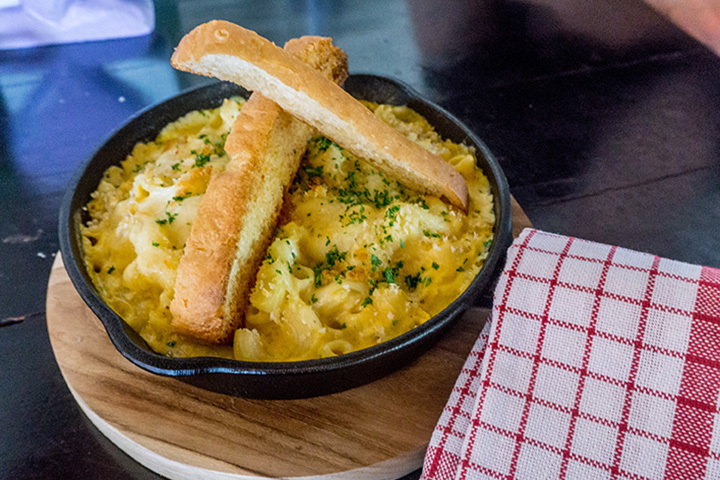 Their macaroni and cheese dish is the perfect complement to their barbecue, but it’s also worth coming for by itself. Bite: American Tapas in Incline Village is a trendy restaurant serving smaller, creative dishes. Everything is worth a bite, but their Green Chili Mac n’ Cheese is stunning. Midtown Eats in Reno, Nevada, is a solid choice for lunch, brunch, or dinner, but their mac and cheese with bacon is served only during lunch hours. That means you’ll need to stop by Monday-Friday from 11 a.m.- 5 p.m., or Saturday and Sunday from 3 p.m.- 5 p.m. to taste this tasty morsel. It wouldn’t be a true Nevada best-of list if we didn’t include at least one casino. In this case, Casino Fandango in Carson City, Nevada, happens to serve one of the best lobster macaroni and cheeses in the entire state. You could be forgiven for thinking Coffee Mug Restaurant is a coffee place only—in fact, they serve breakfast, lunch, and dinner. Their dinner menu includes a delicious homemade mac and cheese “for grownups,” according to their menu. Eating @ the best breakfest place in Nevada! Ella Em’s Soul Food in Las Vegas serves up traditional soul food with a lot of love and bursts of flavor. The menu is chock-full of find traditional comfort food favorites, like pork chops, country friend steak, and chicken and waffles, along with scrumptious mac and cheese. Rock’N’oodles styles itself as a “fast, casual restaurant that specializes in music inspired eclectic noodle creations.” Located in Las Vegas’s Art District, their Buffalo Soldier and Sweet Home Alabama mac and cheese dishes will leave you singing. Kitchen Table’s relaxed environment is the perfect atmosphere to chow down on some mac. They’re only open for breakfast and lunch, but don’t let that deter you: their duck and cheese omelet, made with house-made mac and cheese and duck confit, is worth getting up early for.